A new mapping project in Clyde River, Nunavut, is bringing generations of Inuit knowledge and decades of science together at the click of a mouse. 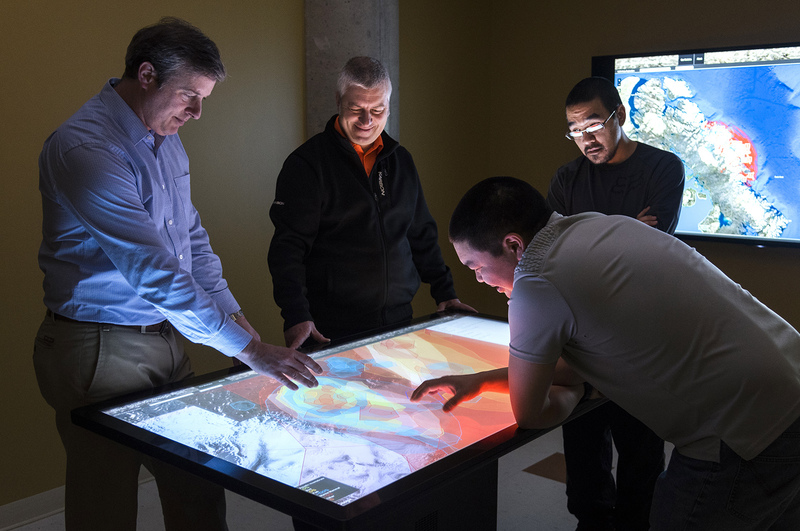 Clyde River’s Ittaq Heritage and Research Centre is creating an interactive atlas with help from the Geomatics and Cartographic Research Centre at Carleton University. The atlas provides easy access to information that was previously hard to find or simply hadn’t been recorded, including scientific studies from the area and local knowledge about the environment and wildlife habitat, history and place names. Over the centuries, Inuit have overlaid their land and sea-ice with thousands of place names, most of which do not appear on any map. Knowing those place names can be the key to survival in an emergency such as a snowmobile breakdown in an isolated spot. Robert Kautuk (front, right) and Mike Jaypoody of Ittaq meet with Geomatics and Cartographic Research Centre researchers Peter Pulsifer and J.P. Fiset at Carleton University to work on module designs for the Clyde River Knowledge Atlas. (Photo: Dwayne Brown). The online atlas, which the community will be able to access later in 2017, shows more than 300 place names in the Clyde River area, and adds more information that Jaypoody and his colleague Robert Kautuk have collected: videos of elders talking about the significance of places, their important features, what they were used for in the past, as well as photos that younger people can use to familiarize themselves with these points on the landscape. Once it’s ready, people in the community will be able to use the information in many ways — for planning, education and essential background when considering proposals for new development projects on their land. The technology can easily be transferred from one community to another, and the same mapping system is now being used in Cambridge Bay, Nunavut, and in other Arctic Inuit and Alaskan Yupik communities. Pond Inlet, at the northern end of Baffin Island, is planning a similar atlas, and Gearheard and her colleagues will be travelling there to teach people how to use the technology.